A few days ago, we got an invite to the Kansas-Missouri IG Rescue halloween party. 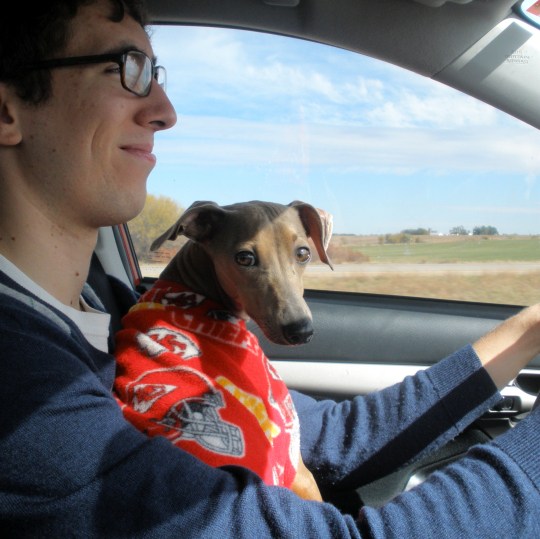 A fancy new humane society complex recently opened up in Wichita, complete with a “party room” where Mosey met with over 20 other Italian Greyhounds for a “small” get-together. The dogs that Mosey fostered with were there, (we call them his “brothers”) along with other IGs from the region. Mosey always seems small to me until he gets around other IGs; at 17 pounds he was among the 3 biggest dogs there! 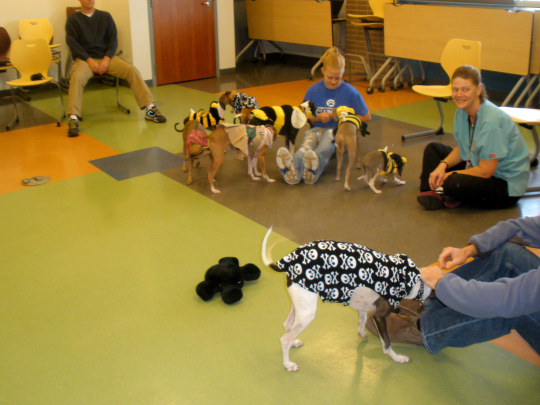 You might be able to tell that the bumblebee costume proved popular (there were 4 of them). Mosey’s “brothers” all had on skull-and-crossbones hoodies and two other IG’s came as a boy and girl scout. Very cute. Mosey just wore his Chiefs jacket that I made him (I’ll post DIY instructions sometime) which he’s been wearing a lot since the weather has started to cool down. It was impossible to get a good shot of the dogs because none of them would stop moving! Mosey was a little bit of a bully, he is definitely the alpha type and finds it necessary to be the center of attention. We had to take him outside once so he could chill out a little bit. He always gets really worked up when around other dogs! Not in a bad way, he just gets really excited. What did you do or are you doing tonight for Halloween?? This year will by our first year passing out candy since we’re in an actual neighborhood! Very cute – looks like fun.